The fact that “Jesus is revealed from heaven in blazing fire” is also a reference to the destruction of Israel, the earth, by fire. Immediately after this fiery army of angels was seen in the clouds, the Roman legions attacked and burned the province of Israel leaving much of it a charred wasteland. Thus the Lord Jesus had truly been “revealed from heaven in blazing fire” during Israel’s first century war with Rome. For a detailed explanation of the literal historical fulfillment of these verses in the first century see the following commentary on 2 Thessalonians 1:6-10. 2 Thessalonians 1:6 Preterist Commentary: The Trouble in v. 6 is the Persecution of Christians in the First Century. In fulfillment of vs. 6-10 the Jewish persecution of the Christian saints mentioned in vs. 6-7 is believed to have ended at the fall of Jerusalem and the destruction of the Temple in A.D. 70. As a consequence of the Jewish War antisemitism ran rampant throughout Rome during the Flavian Dynasty. This anti-Jewish sentiment was so bad, in fact, that Titus had to send away his Jewish lover, Queen Berenice, shortly after the fall of Jerusalem. Not only were the Jews in no position to persecute the saints at this time, they also had less motive. Addressing the persecution of the saints, Jesus is recorded to have said, “And will not God bring about justice for his chosen ones, who cry out to him day and night? Will he keep putting them off? I tell you, he will see that they get justice, and quickly (Luke 18:7-8).” The justice spoken of here is hinted at in 2 Thessalonians 1:6-10. A Realized Eschatology Interpretation and Commentary of 2 Thessalonians 1:7: According to v. 7 and Revelation 19:11-14, Jesus was to lead an Angelic Army in the Clouds at the Second Coming. An Angelic Army was seen in the Clouds in A.D. 66, at the Start of the Jewish War. I saw heaven standing open and there before me was a white horse, whose rider is called Faithful and True. With justice he judges and makes war. . . . He is dressed in a robe dipped in blood, and his name is the Word of God. 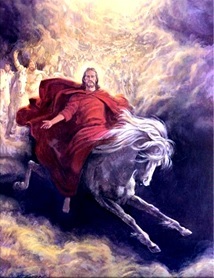 The armies of heaven were following him, riding white horses and dressed in fine linen, white and clean. 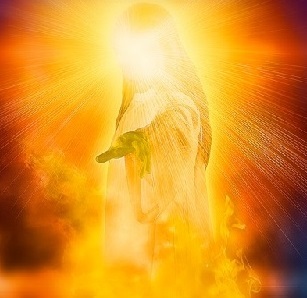 2 Thessalonians 1:7 Commentary: According to Acts 9:3-6 and Revelation 1:13-16, Jesus’ Resurrection Body was Further Glorified after His Ascension into Heaven such that it Beamed with Radiance like Blazing Fire. 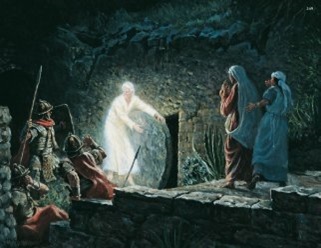 Thus Jesus’ Body took on a Form similar to that of the Angels of Heaven (2 Corinthians 11:14 and Matthew 28:2-3). 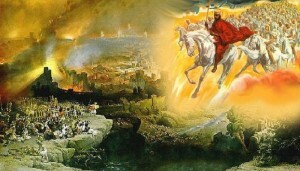 Why does 2 Thessalonians 1:7 imply that Jesus was to take on a form like that of blazing fire during His second coming? The Bible implies the fact that after Jesus ascended into heaven, His body was further glorified so as to take on the bright, fiery likeness of the Father (Ezekiel 1:26-28) and the angels of heaven (Matthew 28:2-3, 2 Corinthians 11:14) as shown in Acts 9:3-6 and Revelation 1:13-16. See How the Resurrection Bodies of the Saints Perfectly Mirror Jesus’ Resurrection Body after His Ascension Into Heaven Fulfilling Philippians 3:20-21 and ALL Other Bible Verses on the Resurrection!!!. Angels are sometimes also described as beings of light according to Matthew 28:2-3. After his ascension into heaven, Jesus’ resurrection body was further glorified according to Revelation 1:13-16 such that it resembled the image of the Father and the heavenly host—shinning like blazing fire. A Covenant Eschatology Exposition and Commentary of 2 Thessalonians 1:6-7: This Fiery Army in the Sky also fits the Timing Implied in 2 Thessalonians 1:6-7. As stated above, vs. 6-8 declare that God’s vengeance will begin “when the Lord Jesus is revealed from heaven in blazing fire with his powerful angels (2 Thessalonians 1:7).” This angelic army in the sky was seen in Iyyar of A.D. 66–the same month and year in which the Jewish revolt began. During the Jewish War and the death of the lawless one, I believe Jesus made several miraculous appearances including the one mentioned above. These various appearances of Christ during and shortly after the Jewish War appear to illustrate all the diverse ways God appeared to people in the Old and New Testaments. They also seem to literally fulfill every detail of every prophecy concerning the parousia or second coming. See Historical Evidence that Jesus was LITERALLY SEEN in the Clouds in the First Century. 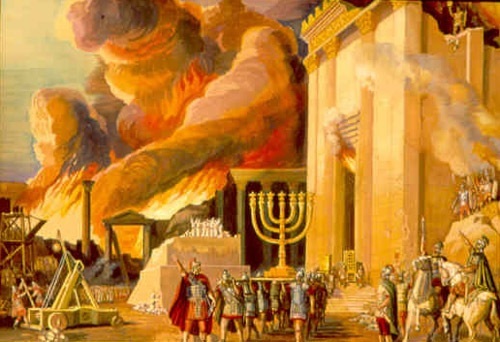 2 Thessalonians 1:7-10 Commentary: The Fact that “Jesus is revealed from Heaven in Blazing Fire” is also a Reference to the Destruction of Heaven and Israel, the Earth, by Fire as predicted in 2 Peter 3:7-13. 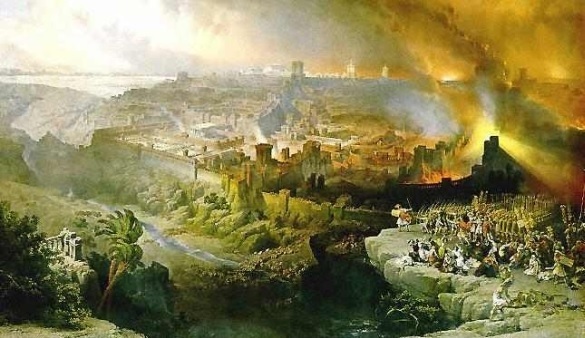 Preterism Explained and Interpreted, A Commentary of 2 Thessalonians 1:7-10: The Land of Israel was burned by the Romans leaving it a Charred Waste. Throughout the Book of Revelation, the Book of Daniel and much of the Bible, earth represents the nation of Israel and sea, the Gentile nations. See In the Bible “Earth” Signifies the Specific Land Addressed While “Sea” Symbolizes Foreign Nations. 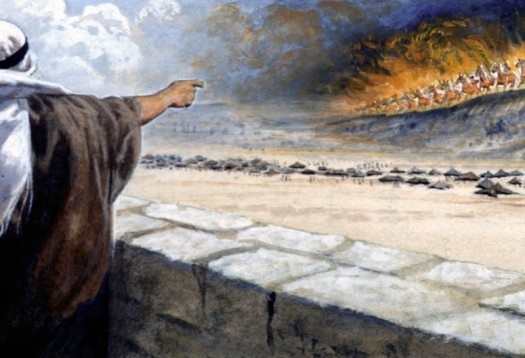 In War of the Jews, Josephus repeatedly mentions the fact that as the Roman army actively suppressed the rebellion in Palestine, they burned many of the cities and much of the surrounding countryside as part of Rome’s scorched-earth policy.7 Thus the fact that Jesus was “revealed from heaven in blazing fire” foreshadowed the ultimate destruction of Israel, the earth, by fire. It is interesting to note that if a fire is sufficiently large the reds, yellows and orange hues of the flames can reflect in the smoke in the sky above the fire giving an illusion that the sky is also on fire at this time. For an added explanation see 2 Peter 3:5-13: A Preterist Commentary. A Full Preterist View–“This will happen when the Lord Jesus is revealed from Heaven in Blazing Fire with His Powerful Angels”: Was 2 Thessalonians 1:7 LITERALLY fulfilled at the Final Appearance of Christ at the Death of the Beast and Subsequent Eruption of Vesuvius? 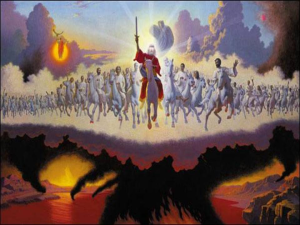 The fact that Christ is “revealed from heaven in blazing fire with His powerful angels” during the appearance of His coming also seems to literally describe the final miraculous appearance of Christ at the death of the lawless one. See The Miraculous Historical Appearance of Christ at the Death of the Beast Fulfills 2 Thessalonians 2:8 and Revelation 19:19-20. 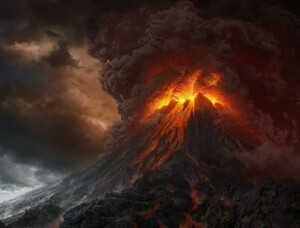 Was the Lord Jesus “revealed from heaven in blazing fire” during the eruption of Vesuvius? As indicated in the above preterist commentary on 2 Thessalonians 1:6-10, Jesus was, in fact, “revealed from heaven in blazing fire with his powerful angels” when in fulfillment of 2 Thessalonians 1:7 and Revelation 19:11-14 a fiery army was seen in the clouds immediately before the burning of Israel during the Jewish War. 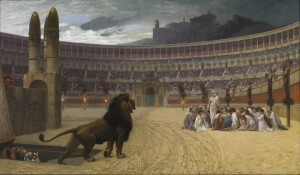 The second wave of persecution broke out in Rome in A.D. 64. At this time Christians were draped in animal skins and ripped apart by dogs or crucified in a major public spectacle. And at night, they were burned as human torches to light the streets of Rome. (Tacitus Annals 15.44.4, cited in Robert E. Van Voorst, Jesus Outside the New Testament: An Introduction to the Ancient Evidence, (Grand Rapids: Eerdmanns, 2000), 42.) 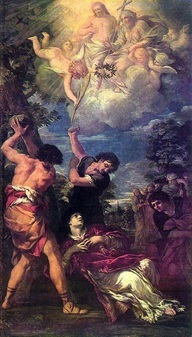 According to church tradition, it was during this massacre that Peter was crucified and Paul, beheaded. This, however, is not the persecution the church is said to be facing in vs. 6-7 since 2 Thessalonians was written in A.D. 51 or 52 and the Roman persecution began in A.D. 64. Sepher Yosippon A Mediaeval History of Ancient Israel translated from the Hebrew by Steven B. Bowman. Excerpts from Chapter 87 “Burning of the Temple” cited in http://fulfilledtheology.ning.com/forum/topics/historical-records-with-some (9/16/2014) Notice that Yosippon states that the horses seen in the sky were horses of fire whereas Revelation 19:14 says that the angels rode white horses during the parousia, is this a contradiction? No. Many people who have had revelatory near-death experiences (NDE’s) state that beings in heaven exude brilliant white light. Thus the horses described by Yosippon would have also likely shown in a brilliant white light like that of other beings in heaven. This brilliant white radiance would likely be described as fire to a first century observer. See 2 Peter 3:5-13: A Preterist Commentary. Josephus The Wars of the Jews 3.4.1; 4.8.3; 4.9.7; 5.6.2; 6.1.1.